The shield denotes our belief in democracy, liberty and the American way of life. The gear, symbolic of the industrial society, denotes the interdependence and cooperation of the individual working with labor and management for the betterment of mankind. The flaming torch reflects the light of knowledge, which dispels the darkness of ignorance. In the light of the torch, progress will be made toward the vocational goals of the individual. The circles represent the challenge of modern technology and the training needed to accept and master the challenge of new technical frontiers and the need for continuous education. The hands portray a search for knowledge and our desire to acquire a skill. In the process of attaining knowledge and skill, we will develop a respect for the dignity of work and become productive and responsible citizens. Note: The emblem should not be used to represent the organization. 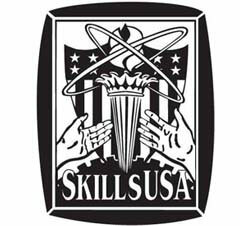 Please use official SkillsUSA logos. The colors red, white, blue and gold represent the national SkillsUSA organization. Red and white represent the individual states and chapters. Blue represents the common union of the states and of the chapters. Gold represents the individual, the most important element of the organization. Wearing the official SkillsUSA attire adds a sense of unity and identification, as well as enthusiasm, to meetings, ceremonies, presentations and activities. Members are encouraged to strictly follow the guidelines for official attire during ceremonies, visits with dignitaries, officer campaigns and similar occasions. To order official clothing and work uniforms for competition, go to the SkillsUSA Supply Service.